171:5.1 Late on the afternoon of Thursday, March 30, Jesus and his apostles, at the head of a band of about two hundred followers, approached the walls of Jericho. As they came near the gate of the city, they encountered a throng of beggars, among them one Bartimeus, an elderly man who had been blind from his youth. 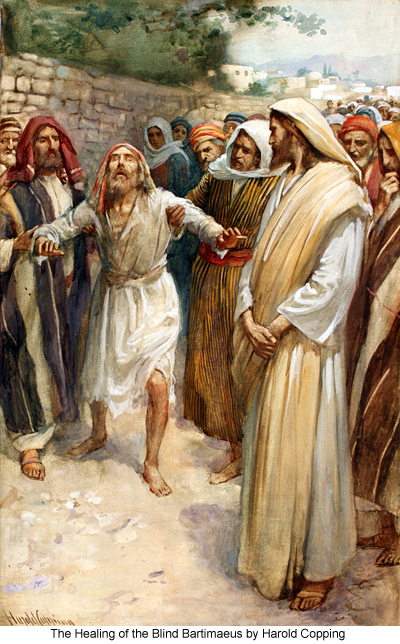 This blind beggar had heard much about Jesus and knew all about his healing of the blind Josiah at Jerusalem. He had not known of Jesus' last visit to Jericho until he had gone on to Bethany. Bartimeus had resolved that he would never again allow Jesus to visit Jericho without appealing to him for the restoration of his sight. 171:5.2 News of Jesus' approach had been heralded throughout Jericho, and hundreds of the inhabitants flocked forth to meet him. When this great crowd came back escorting the Master into the city, Bartimeus, hearing the heavy tramping of the multitude, knew that something unusual was happening, and so he asked those standing near him what was going on. And one of the beggars replied, "Jesus of Nazareth is passing by." When Bartimeus heard that Jesus was near, he lifted up his voice and began to cry aloud, "Jesus, Jesus, have mercy upon me!" And as he continued to cry louder and louder, some of those near to Jesus went over and rebuked him, requesting him to hold his peace; but it was of no avail; he cried only the more and the louder. 171:5.3 When Jesus heard the blind man crying out, he stood still. And when he saw him, he said to his friends, "Bring the man to me." And then they went over to Bartimeus, saying: "Be of good cheer; come with us, for the Master calls for you." When Bartimeus heard these words, he threw aside his cloak, springing forward toward the center of the road, while those near by guided him to Jesus. Addressing Bartimeus, Jesus said: "What do you want me to do for you?" Then answered the blind man, "I would have my sight restored." And when Jesus heard this request and saw his faith, he said: "You shall receive your sight; go your way; your faith has made you whole." Immediately he received his sight, and he remained near Jesus, glorifying God, until the Master started on the next day for Jerusalem, and then he went before the multitude declaring to all how his sight had been restored in Jericho.